Purple needlegrass can compete in non-serpentine soils with annual grasses; see it, for example, here and there along the Dish Trail on the Academic Preserve. Its presence along the path from the overflow lot to the Field Station and in the picnic area results from staff seeding the area in 2002 with locally-collected seed. Purple needlegrass forms tufts, creating a hummocky appearance on the landscape. This is nicely seen (depending on the mowing schedule) at the fire-truck turn around on chert-derived soils where Grassland Fire Road meets Goya trail. Older plants generally have larger tufts. Research at the Hastings Natural History Reservation in Carmel Valley indicates that larger individuals, up to 12-inch diameter, are 100-200 years old, or perhaps substantially older. Purple needlegrass has been the subject of much discussion and debate. Did it dominate pre-European settlement grasslands? Its response to fire and grazing? The significance of ecotypic species variation for revegetation uses? Its suitability for restoration in different soils and climates. 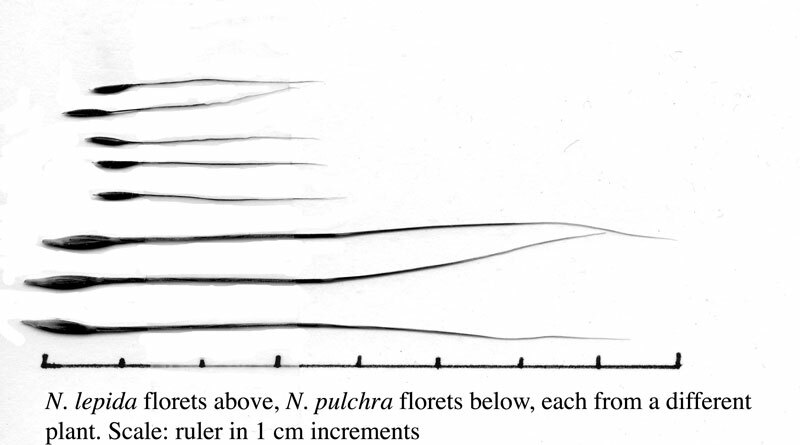 N. pulchra is probably the most common native perennial grass today, and in many locations that is due in some part to human agency: it colonizes disturbed areas and is widely used in revegetation. Nassella pulchra and Nassella lepida are common on the Preserve. Though these two needlegrasses are reported to hybridize, we have not noticed intermediate forms at Jasper Ridge. Foothill needlegrass thrives in shady margins of chaparral and woodland, but also grows in full sun, often in company of the locally more abundant N. pulchra. 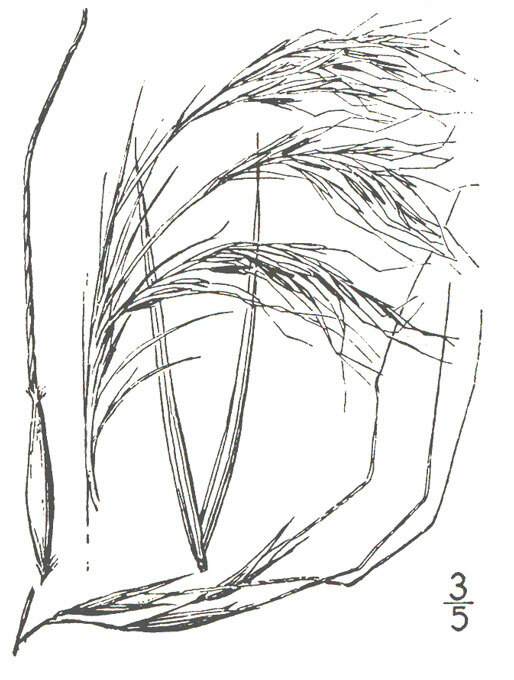 Spikelets are single-flowered, as are those of all other members of Stipeae (needlegrass tribe). The two Preserve needlegrasses resemble one another but N. lepida is smaller and noticeably finer, with lemma awns usually about half-as-long (to 3 cm.) as those of N. pulchra. Look for it in serpentine along the edge of the diminutive forest bordering Trail 15, growing with another partial-shade-loving grass, Melica torreyana. Every so often N. lepida and N. pulchra are together under the canopy of Rhamnus californica, Quercus agrifolia, and Q. durata. 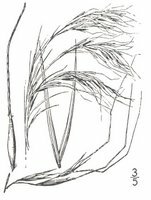 Foothill needlegrass, like its frequent companion Melica torreyana, grows on a variety of soil-types on the Preserve. Nassella pulchra and Nassella lepida are common on the Preserve. Though these two needlegrasses are reported to hybridize, we have not noticed intermediate forms at Jasper Ridge. Name: Latin: nassa, a basket with a narrow neck | elegant.